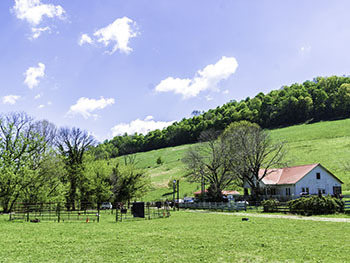 Welcome to Peaceful Pastures where we produce the finest all natural, pastured, grass-fed beef, pork, lamb, chicken, and turkey. At Peaceful Pastures we, Jenny and Darrin Drake, are here for YOU. We welcome your questions and pledge to answer them in a forthright and honest manner. We love what we do for a living and are blessed to be able to share it with you and your family. As full time farmers, we are dedicated to producing and providing the best meats possible naturally, on pasture and ethically, with integrity. Consumers are increasingly concerned about their food; E. coli, Mad Cow, Downer cows, and massive meat recalls dominate public fears, but there IS an Answer - "Know Your Farmer, Know Your Food." By speaking directly with the farmer you can ask the questions that are most important to you: Grass-fed and grass finished? Hormone implants? Antibiotics in feed? Pesticides? Humane treatment and slaughter?